Follows the awkward experiences and racy tribulations of a modern-day African-American woman. Two black women share friendship and uncomfortable experiences. The pilot is available on HBO NOW, HBO GO and HBO On Demand ahead of its television debut, Sunday, October 9. Props to Issa on her success. I watched the first episode. Started off with the "why do you sound white?" and her friend telling her asian coworker black men like everyone but black women but I enjoyed it towards the end. I've been looking forward to this show for a long time so I hope it doesn't disappoint. I met Issa about a year ago and she was really nice and has a great vision for the type of entertainment she wants to make. I saw promo on HBO and it didn't pique my interest and it just reminded me of the "other" shows HBO tends to have that get aired on weird days sometimes at weird times. I'll check out the first ep though. It was cool. Got funny when they went to the club. The rap, broken ***** brought lulz. "I'm not looking for a relationship." I like the concept and idea of a show taken more realistically from the single black woman's perspective. This Issa chick a weirdo but in a good way. Knew a few chicks like her. Music was dope as well. 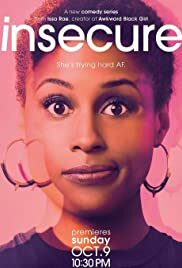 i heard some iffy things about her web series "Awkward Black Girl"
Im trying to hold of watching episode one because we wont get episode two til mid October. They got me like that with the night of, never again. Enjoyed the Awkward Black Girl Series; will check this out. I watched the first episode, and thought it was really good. I was a fan of Awkward Black Girl, so I was excited to see she got a show on HBO. It looks promising. was dying when she was getting ready in the mirror "TAKE THIS NANI!" Glo'd up is right. She lookin real good compared to the web series days. Beautiful skin and teeth. I did not know when I watched the first ep it was some early treat. Is this like a black version of Girls? If so I aint watchin. idk his screen name but his name is Tristan and he said he will be on the show. Not sure when. I didn't get and version of Girls from this.